I still haven’t written Roche Harbor 3. 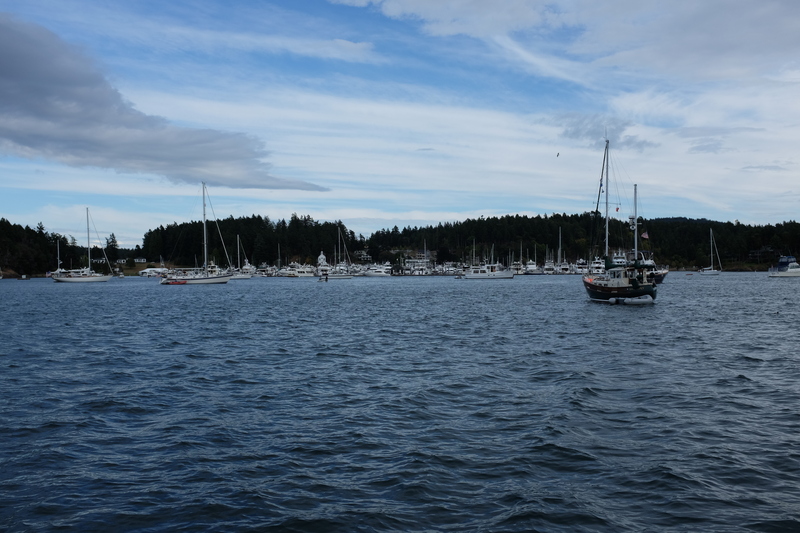 When I do, I’ll describe our wonderful outing last Saturday in the waters of the San Juan Islands and the spectacular seafood feast during our break from boating. The outing ended with us being dropped at the Roche Harbor dock around 5:30 for our 6:00 Kenmore Air seaplane flight back to Seattle. (I took the shot above late in the afternoon, on our way back.) And what a beautiful flight it was, culminating as we swung from south to north by the top of the Space Needle and came in for our landing on Lake Union. We could see the faces of the people on the Space Needle observation deck. Well, Gail couldn’t. To my astonishment, she was looking at her iPhone. Our flight was scheduled for 11:00 am. We arrived around 9:50 and spent some time parking. There’s a small free lot by the terminal, but it was full. The website spoke of a pay lot next door. We interpreted that to refer to the strip of public parking just off the street to the north of the terminal, found a spot there, paid for the day’s parking (Friday–it’s free Saturday), and checked in. I mention this detail because I will return to it in another post, the choice being a poor one. The moment I spotted our car on our return, I knew something was wrong. It’s like the windows weren’t there. I could see right through. No tint. Gail’s reaction, as she would explain later, was different. She thought another car just like ours had parked next to our car and blocked the view of it. Sure enough, as we drew nearer, it was our car, and the windows were open. Or gone. Sunroof too. Once we got to the car, we saw that the glovebox was open and papers were strewn over the front passenger seat and floor. Someone had broken in, obviously. But how did he (I assume he) open all the windows? Were the windows even there? Or had he carefully removed them all? Unlikely, but it seemed equally unlikely that he could have opened them all without starting the car. I suggested that Gail get her key out and start the car so we could at least verify that the windows were there. Which they were. Sunroof too. Everything was intact. Nothing was stolen. I decided to go around and make sure each door worked. Only when I got to the final door, the driver’s, did I see that the lock mechanism had been punched out, with one piece on the ground. He must have hammered it in or broken it some other way, then gotten the door open. Did the alarm go off? Did he start the car to open the windows? If so, why not drive away in it? And anyway, why open them at all, unless the point was to inflict damage, in case it were to rain for instance? Or to give others access? Anyway, as we relieved as we were that the car worked, that nothing was stolen, that the damage appeared confined to the broken lock, that nothing got wet, that no one malicious took advantage of the open windows and sunroof to vandalize anything, this was just about the most depressing sight imaginable. Monday morning Gail called the dealer and prepared to drive the car up. I was talking to Bert, our remodel site superintendent and friend, about what happened when he mentioned that he knows some cars have a feature allowing you to (intentionally) open all windows at once. I went online to see how that might be done and read that you can hold down the unlock button on the key for 3 seconds to effect this. Maybe it’s hot and you want to get air circulating as you approach the car. Hold the button down and everything slides open. I went out and tried it on my car. Sure enough. That made me feel a lot better. Presumably the miserable person who broke our lock didn’t intentionally open all the windows. Rather, his lock jimmying must have triggered the window-opening signal. He may have been taken entirely by surprise. Who knows? Maybe he even felt bad about it, wanting access to our belongings but not wanting the car left open to the elements. Nonetheless, we had a broken lock. Gail drove the car out, got a loaner, ended up waiting three days for all the necessary parts to come in. She brought the repaired car home Thursday afternoon, just in time for our early morning departure the next day, yesterday, for New York, where we are now.